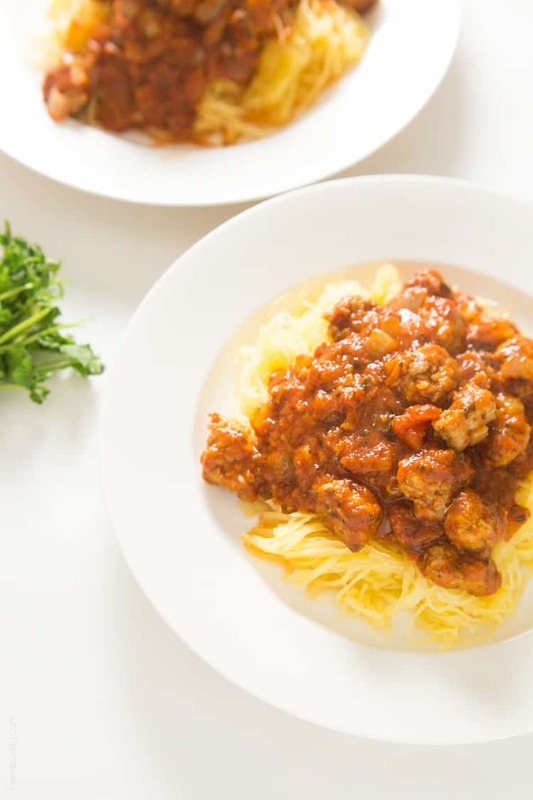 Spaghetti Squash and Meatballs – an easy, healthy spaghetti made with spaghetti squash noodles and Italian sausage meatballs. Paleo, gluten free, low carb, dairy free and Whole30 too! My family all went out of town together over the 3 day weekend and rented a vacation home in gold country. I volunteered to come up with the menus for the dinners. I must have been feeling very brave. My mom is vegan. My sister is vegetarian. As much as possible lately, Shawn and I try to eat Paleo. Do you know hard is to cook a meal that is appealing for everyone? Basically the only thing we all share is fruits, nuts and vegetables. So when I find a recipe that can very easily be altered to suit everyone’s taste, it is a very big deal. One of the first recipes that came to mind was spaghetti and meatballs. I have been cooking this spaghetti squash and meatballs recipe for dinner for Shawn and I quite frequently and I knew I could easily adapt it so it could work for everyone. A spaghetti squash roasted in the oven for me and Shawn, regular spaghetti noodles boiled for everyone else, a veggie based marinara sauce that everyone can enjoy, and meatballs cooked in the oven and served on the side for the meat eaters. And it was a hit! Was just a few extra steps than usual, but worth it to have a dinner than everyone can eat together. I just love spaghetti squash. It is my favorite vegetable based noodle. I still haven’t found a way to cook zucchini noodles so they aren’t overly watery when cooked, and I can’t get Shawn on board to eat them raw (even though I like them raw!). 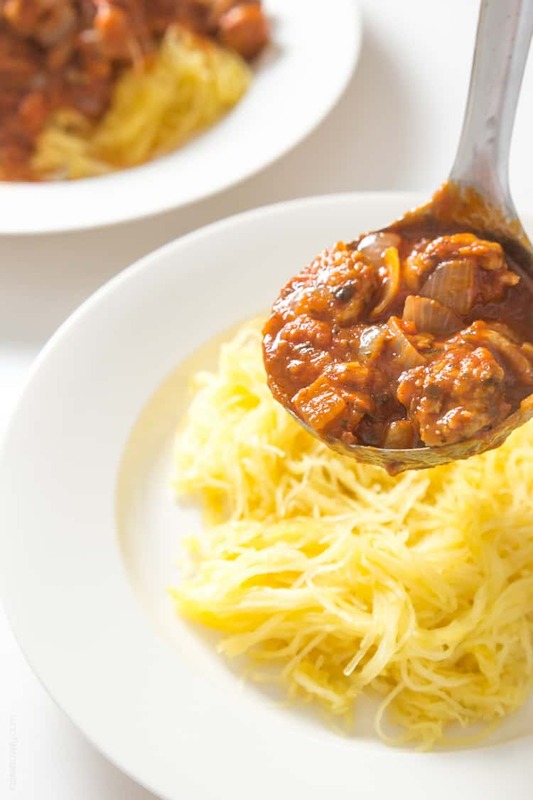 Spaghetti squash is very close to real spaghetti – al dente with a bit of crunch and mild in flavor. Have you tried roasting your spaghetti squash whole? It is by far my new favorite way to cook spaghetti squash. Those things are BIG and HARD. Like trying to cut a pumpkin in half. Every time I would try and cut it in half I would be sending up silent prayers that the knife wouldn’t slip and cut off my finger. Now I roast the entire thing whole for 45-60 minutes, let it cool, then easily cut threw the softened squash. It’s a thing of beauty. To keep this a super simple weeknight dinner, I make Italian sausage meatballs. I just cut the casings off of sweet Italian sausages (or spicy if that’s your thing! ), break off 1″ pieces and roll them into balls. A great meatball shortcut that is fast and full of flavor. I also use my favorite marinara sauce rather than making homemade. Trader Joe’s Organic Tomato Basil Marinara Sauce is my favorite! No need to transfer canned tomatoes to the blender. The less clean up the better, right? Even though this recipe technically takes 1 hour 20 minutes, an hour of that is the spaghetti squash roasting away in the oven. I’ll come home from work, throw the spaghetti squash in, and go about my business. An hour later, I’ll take out the spaghetti squash to cool, and cook up the meatballs and marinara sauce in about 20 minutes. Can’t beat a delicious, nutritious and healthy (paleo, gluten free, low carb, dairy free and Whole30 too!) 20 minute dinner. Preheat your oven to 350 degrees with the rack in the middle position. On a parchment lined baking sheet, roast the spaghetti squash whole for 45 minutes-1 hour, until soft when squeezed. Rotate the spaghetti squash half way thru baking. Remove the squash from the oven and allow to cool for 20 minutes. While the spaghetti squash is cooling, preheat a large skillet over medium high heat. Add the olive oil and cook the sausage meatballs until golden brown, about 8 minutes, stirring occasionally. Add in the onion and zucchini to the meatballs, season with salt and pepper, and continue to cook until the vegetables soften, about 5-8 minutes. Add the garlic and cook for 1 more minute. Add in the marinara sauce, and reduce the heat to low. Simmer for a 5 minutes minutes. While the sauce is simmering, using a very large knife cut the spaghetti squash in half lengthwise. Scoop out the seeds and discard. 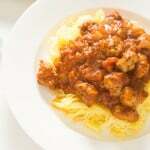 Using a fork, scrape out the spaghetti squash noodles and transfer to a plate. Season with just a pinch of salt and pepper. Top the spaghetti squash noodles with the meatballs and marina sauce. Serve warm. Puh-lease find a solution to watery zucchini noodles Keri! I’ve tried salting them, but that makes them a different kind of squishy. There has to be a way! Natalie, you have NO idea how excited I am to try this! It’s been WAY too long since I last had spaghetti squash and I’m dying over how awesome those meatballs look on top! This is goin’ on my dinner menu for sure! Sounds like you aced cooking dinner for your family! This dish looks fantastic, Natalie! I love the idea of using squash instead of noodles. Sounds so delicious! And gorgeous pictures, too! That is SUCH a smart meatball trick! 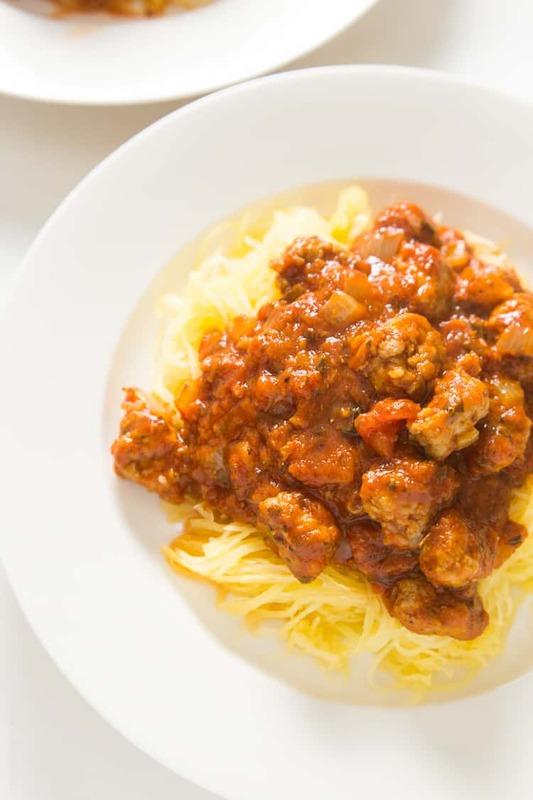 I love spaghetti squash and this sounds like such a simple dinner. I need to pick one up so I can make this! That’s a great tip to roast the spaghetti squash whole! 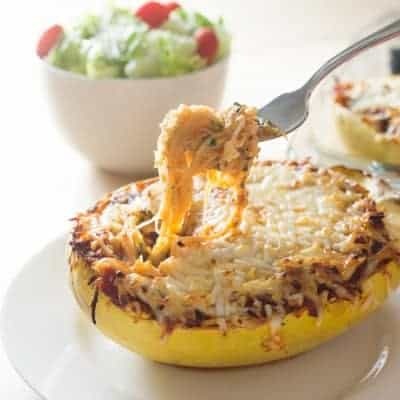 I haven’t had spaghetti squash in so long but you’re reminding me that I should add it to our menu soon! 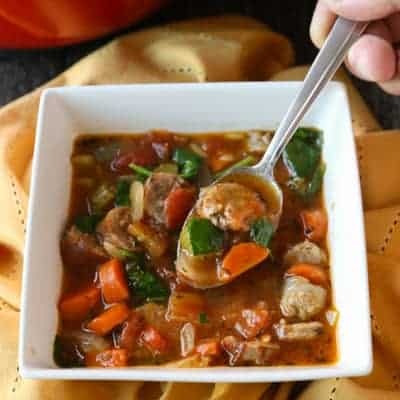 It looks delicious with your easy sausage meatballs! Great idea to roast those rock hard squash whole…gonna give it a try! I’m over my Whole30 now but it turned me into a confirmed Paleo person. Well I’m actually about 80/20. 80 percent Paleo and 20 percent wine and cookies…a gal has to live! It makes it super easy to maintain my weightless and I still get a bit of the good stuff I crave! Lovely post as usual! The best! Just had spaghetti squash with turkey meat sauce the other night and barely missed the pasta. Love healthy comfort food and that is such a great meatball trick!! Can you believe I’ve never had spaghetti squash before? I need to work on that! Your version looks delicious and its almost impossible to tell its not the real thing. I like your safe method of cutting a hard shelled vegetable by baking it first. There is another way to safely cut one of those, by sawing through the shell before baking, if you want half shells for some reason. Use any kind of small, fine-toothed woodworking saw after wedging the veggy part-way into a half open drawer, (between the drawer front and the cabinet) as a vise to keep it from rolling. Keep moving and re-clamping the squash to avoid sawing up the kitchen. I love that idea Malcolm! You’re a genius! That is so smart to clamp it in between a half way shut drawer! I am definitely going to try that next time I need just a half. Shawn has a ton of tools, I’m going to raid his tool drawers to find a little saw. I’ve been using a serrated bread knife, but it isn’t quite up to the job. Thank you so much for sharing! 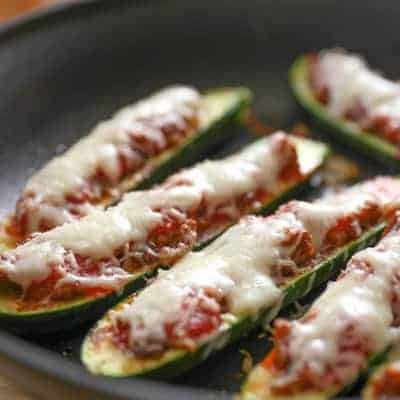 This looks SO good, and I’m not vegan, vegetarian OR paleo! Lol. That must be super hard to accomodate in one meal, but totally worth it if you get to eat with the people you love. Can you believe I have never tasted spaghetti squash before? I need to get on that! This looks like a wonderful recipe. Bet you wouldn’t even miss the ‘real’ pasta! Wow you’re a brave soul to cook for such a crowd. This is a delicious recipe Natalie. It looks so good. Wow, that’s a lot of different diets to cook for! This is a great solution! Right after college I did girls nights with 3 other girls– one was a vegetarian, one couldn’t eat red meat and hated mushrooms, and one was super picky. It was SO hard finding things to make, but kind of a fun challenge! I love this Natalie!! This looks like such a hearty, filling, and healthy meal! I could eat this for dinner every night and never get sick of it! I need to experiment more with zucchini noodles too! Thanks Isadora! Sometimes I’ll make this once a week. It’s such a great weeknight meal. And I need to expirement with zucchini noodles more too.